The Ten-Tec Model R4020 40/20 Meters field-portable QRP transceiver. When I heard from friends that Ten-Tec had announced two new QRP transceivers at FDiM, I almost fell out of my seat. I’ve heard very little in the way of QRP coming out of Sevierville since the sad news of them dropping the popular/legendary Argonaut series. Then, this week, when they announced the news on their (new) website, I got even more excited–these transceivers are field portable and small! They very much resemble my Elecraft KX-1. 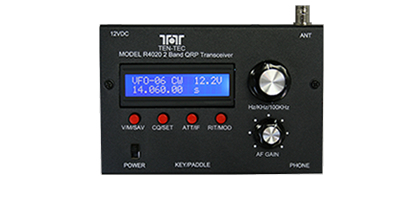 Yes, the R4020 and R4030 is based off the HB-1A transceiver with some minor modifications. We are the exclusive dealer for the R4020/4030 and will warranty and sell this item from our office in Sevierville, TN. We will offer a 1 year full replacement warranty. So, it was true–I was not shocked. Why? The price of the R4020/R4030 is only $249. That’s an incredibly low price for a Ten-Tec item. Too low. I’m not sure what the “minor” modifications are that Ten-Tec made, but I imagine they had to bring it up to FCC compliance and perhaps tweak the receiver a bit. We’ll soon see. I realized, this morning, that I simply need to forgive Ten-Tec for doing this. I love their equipment and hold their company and employees in the highest regard. I can’t blame them for outsourcing a radio–why? This is a tough economy. I’ve been worried about our domestic manufacturers like Ten-Tec and Elecraft (though, surprisingly, Elecraft actually upgraded and moved their production to a larger facility). I’m surprised that they’re able to hang on. I suspect Ten-Tec has had to lean on their other markets (government, enclosures, etc.) to support the amateur radio side of their business. Ten-Tec could probably not put 2009/2010 resources into developing a radio on their own when they had low-hanging fruit, like the HB-1A, just waiting to be brought to the USA (officially). R&D is not cheap–even if it’s in-house. They are servicing this radio in Sevierville, TN. That makes me feel a lot better about about buying one of these transceivers. Ten-Tec service is top-shelf! They really needed to bring QRP back into their non-kit product line. Bottom line? I’ll probably get one of these and try it (well, after I invest in a nice vintage boat-anchor set up). I’m in no hurry as I have an Elecraft KX1 and it is my favorite QRP radio. I will post reviews of the new TT radios as they become available (contact me if you have one). In the meantime, I’ve included some useful resource links below. This entry was posted in Announcements, News, Portable, QRP Radios and tagged BD4RG HB-1A, QRP Transceivers, Ten-Tec, Ten-Tec Model R4020, Ten-Tec Model R4030. Bookmark the permalink.